Swimming is such an important life skill. Join the fun in the water, and let us teach your children swimming and water survival skills that they’ll keep with them for life. At Healthways, we specialise in children and beginner lessons, so that everyone in the family can enjoy and be confident in the water, all year round. We offer swim programs for babies, toddlers, pre-schoolers, primary school age children, early secondary school age students, and adults. We have lessons for everyone in the family. All our teachers are Austswim qualified, and our small class sizes mean that your children will receive more teacher attention. Finalist VIC Swim School of the Year 2015. Winner AUST Most Environmentally Friendly Swim School 2013! Finalist VIC Excellence in Facility Management 2013. Winner VIC Innovative Program of the Year 2012! Winner VIC Teacher of Infants and Pre-schoolers 2012! Winner AUST Teacher of Infants and Pre-schoolers 2012! Finalist VIC Teacher of Swimming and Water Safety 2012. 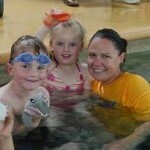 Finalist AUST Most Environmentally Friendly Swim School 2011. Finalist AUST Best Swim School Print Material 2011. President of Swim School Owners Association of Australia (VIC Branch) 2010. Finalist VIC Water Safety Week Program of the Year 2009. Finalist VIC Teacher of Infants and Pre-schoolers 2009. 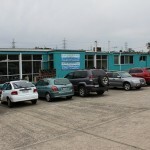 President of Swim School Owners Association of Australia (VIC Branch) 2009. Pre-2009 award wins and finals have been kept off this list to show you more recent achievements, however, more can be supplied if required. We proudly share these achievements with you as an indication of the passion and dedication we have for our profession and for the children that we teach. 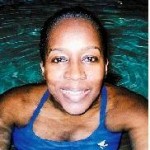 Maximum of 4 students for ALL Learn-to-Swim classes! 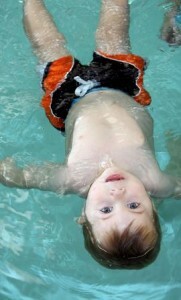 For under 3 year old classes where parents are in the water, there is a maximum of 8 students per class. 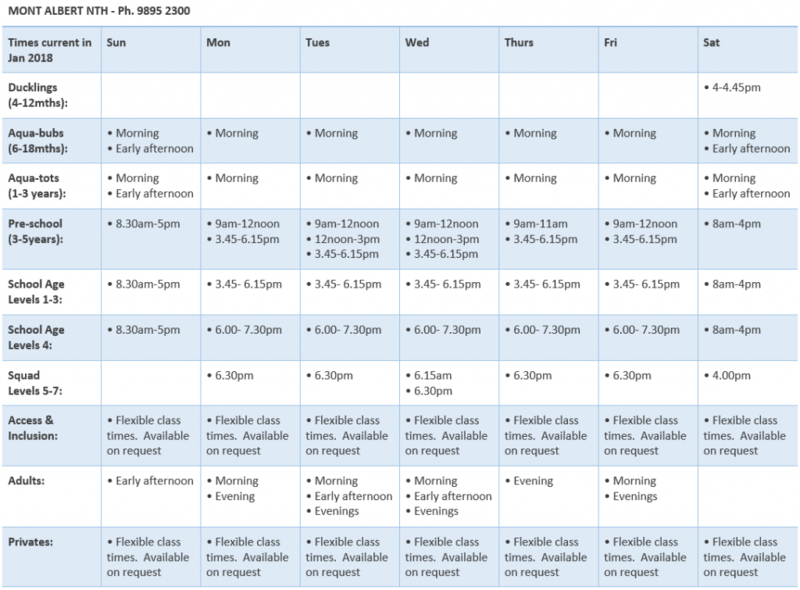 ‘Make up classes’ or ‘Family swim’ options if you miss a class! A ‘Survival Week’ every term where students wear clothing in the water to practice their survival skills! Levels that fit in to the National Grading Guidelines. Special programs including Snorkelling days and Diving workshops. 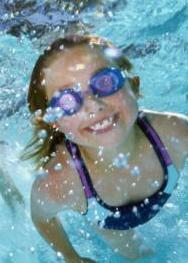 We also encourage parents to stay and watch their children learn to swim as there are NO Spectator Fees. We host a number of swim school events during the year including: Snorkelling experiences, Boat safety weeks, Infant Aquatic Open Days, CPR courses for parents, and Diving workshops. Pool inspections and visits to the centre are welcome at any time. CLICK HERE for Map and Opening times. All classes at Mont Albert North are held in our 0.9-1.2m deep, 4 lane, 18m long, heated indoor pool. The pool is heated to 32 degrees so it’s lovely and warm. Perfect for teaching. This pool is a salt pool – Great for sensitive skin! If you or your child have sensitive skin or eyes the water is gentle on you. Particularly good news for people with allergies, eczema or general skin dryness. For more information on how our salt pool works CLICK HERE. All classes at Ringwood are held in our 0.8-1.3m deep, 6 lane, 25m long, heated indoor pool. The pool is heated to 32 degrees so it’s lovely and warm. Perfect for teaching. Since taking over the building in Jan 2012 we have been steadily making long-term improvements to the facilities. Let us point out some of these to you… Especially important if you have been to the centre before because it is looking and operating better than ever. Please CLICK HERE for information about what improvements have been made. These programs aim to familiarise children with the water, encourage water confidence and introduce independent skills. Parents assist their children in water activities, and develop skills together in: Entries & Exits, Floating, Sculling & Keeping Balance, Underwater skills, Kicking and arm actions, Parent Education, Extra carer and child skills. Nursery Rhymes and a large variety of toys are used to engage the children and assist their mental and physical development. This program develops greater water skills and teaches children across five levels – beginner, beginner gold, confident, intermediate and advanced. Beginner classes introduce students to the water, while progression through the levels results in advanced classes being able to swim independently and developing basic stroke technique. 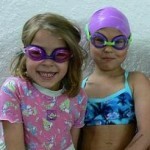 Children are engaged using floatation aids, equipment and/or toys. We aim to make the water an enjoyable experience so children can’t wait to get to the pool for their lesson every week. When children go to school they swap into the equivalent school age level. 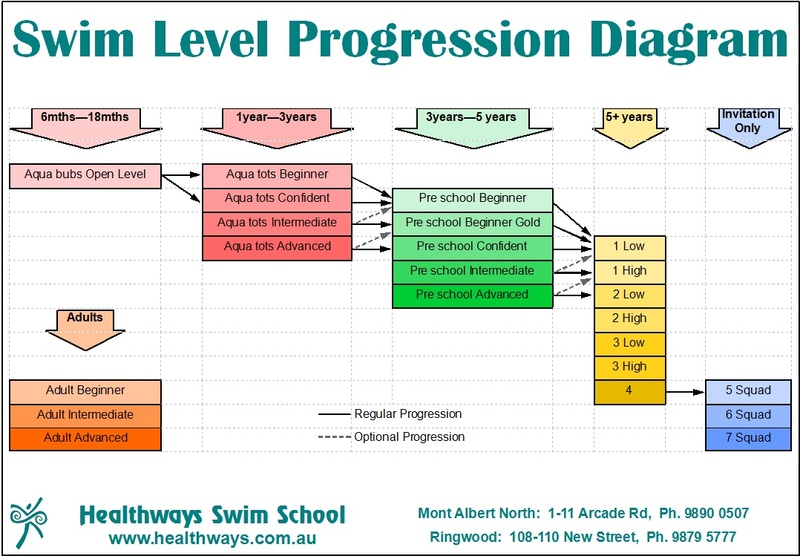 Our school age program is based on the national swimming grading guidelines. As the children progress from level 1 to level 4 they are taught attainable and challenging skills aimed at broadening their water independence, stroke technique and water safety skills. Our classes develop skills in — entries & exits, floating, sculling & treading water, swimming technique on front, swimming technique on back, survival skills, underwater skills, diving skills, rescue skills and endurance. In addition, school age children may participate in special events throughout the year including snorkelling workshops, distance swims, etc. This program provides students with an introduction to a squad environment, while not being intimidating for those children who don’t wish to pursue competitive swimming. It focuses on improving stroke technique and developing endurance and speed. These programs focus on advanced stroke and survival skill development. During these classes improved stroke technique results in improved speed and endurance. 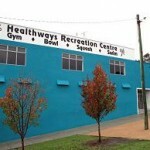 Additionally, the students general health and fitness levels are constantly challenged. These programs provide a fun recreational environment for students who enjoy swimming and/or wish to pursue competitive swimming. These classes provide toddlers, children, teens and adults with the opportunity to benefit from learning in water. Depending on the needs of individual students there are group classes, private classes, and social groups available. These classes provide adults with the opportunity to gain confidence in the water, learn how to swim or improve technique in a personal and friendly environment. Adults can progress at their own pace, while gaining the additional health and fitness benefits of being in the water. Private classes provide adults or children with personal tuition. Whether you’re just starting out or you want extra help with your skills, private lessons give you all the attention you need. Lessons can be arranged for one(teacher)-to-one(student), or for up to one(teacher)-to-four(students). 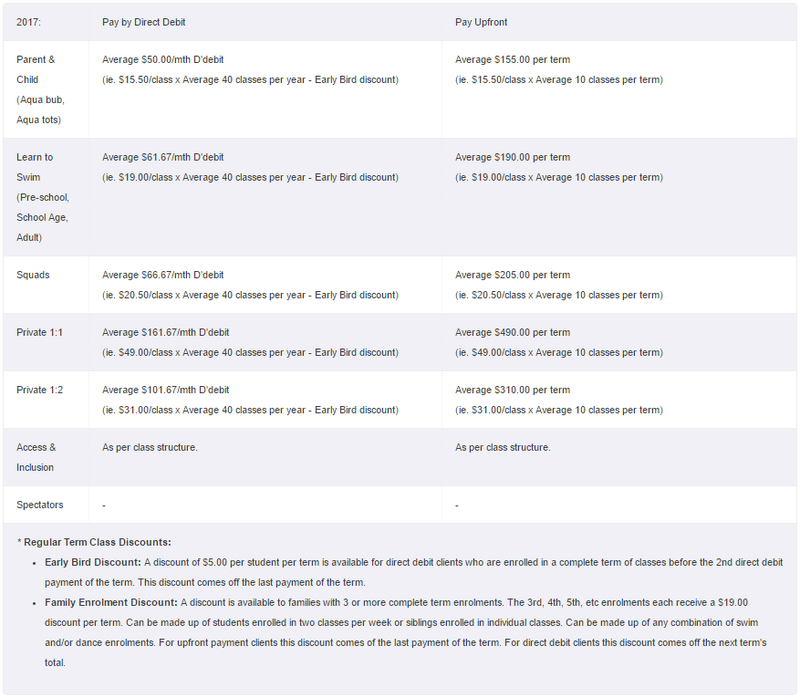 To help students progress through the program, firstly, classes are grouped according to age. Children learn differently as they change from toddlers to pre-schoolers to primary school age and our classes allow children to be taught in age-appropriate ways. Then within each age group, classes are grouped according to ability using comprehensive levels which include skills covering: Entries & Exits, Floating, Sculling & Treading Water, Swimming on Tummy, Swimming on Back, Survival Sequences, Underwater Skills, Safe Diving Skills, Rescue Skills, and Endurance. All our level criteria can be seen at the centre on the pool foyer wall. The levels within each age group fit together as shown below. Holiday Intensive Classes – ie. Classes once per day for 5 consecutive days during the school holidays. (Available for 3 year olds to level 5.) Holiday Intensive Classes happen in the mornings. 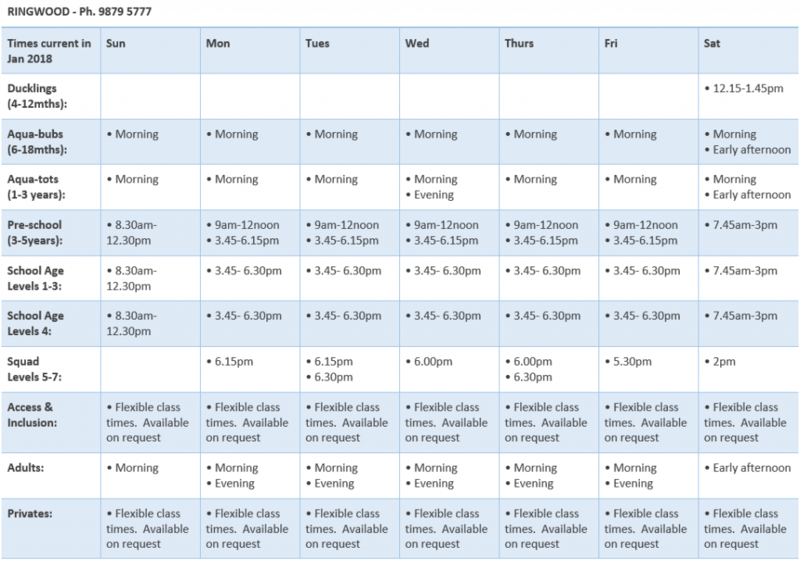 Generally these classes are Mon-Fri, but where there is a public holiday during the week they may run Sun-Thur or Tues-Sat so that there are still 5 classes. To give you an idea of when classes run, please see the tables below. For specific level class times and availability please phone reception. You will be asked some questions about your child’s swimming ability to determine what level they would be suited to, and then reception can give you some available times to choose from. Bookings open Sunday 03/12/17. You can phone/visit anytime as of that date or add your name to the call back list now (bottom of the page). Bookings open Sunday 11/03/18. You can phone/visit anytime as of that date or add your name to the call back list now (bottom of the page). Bookings open Sunday 10/06/18. You can phone/visit anytime as of that date or add your name to the call back list now (bottom of the page). Bookings open Sunday 02/09/18. You can phone/visit anytime as of that date or add your name to the call back list now (bottom of the page). As much as possible, please make the effort to attend all your regular classes so you can develop with the teacher and the other students in your class. Also, if you attend all your classes during the term you go into the draw to win a push bike. Every term, we give away a push bike to a lucky student who attended all their classes during the term. If you are not able to attend your class, ANY absence, for ANY reason, may be utilised as a make-up class or family swim as per ‘What happens if I miss a class?’ in our ‘Policies and Procedures Brochure’ (link available at the bottom of this page). Make-up classes – These are scheduled classes that offer students a chance to attend a different class to ‘make-up’ for an absence in their regular class. There is a maximum of 2 make-up classes permitted per term/intensives. Make-up classes must be taken-up in the term that the absence occurred in. If you are absent from a make-up class, you cannot make-up a make-up class. For all ‘Pre-school’ and level 1-3 ‘School-age’ students: Make-up classes are booked during regular term classes. Bookings can be made any time in the last 3 weeks of the term. Refer to the calendar of events in the centre newsletter for when bookings open. Bookings are made at reception. Level 4 students: Make-up classes are booked during regular Level 5 classes. Bookings can be made any week during the term. Bookings are made at reception. For Aqua-bubs, Aqua-tots, Squad and Adult students: Makeup classes are booked during regular classes. Bookings can be made any week during the term. Bookings are made at reception. Family Swims – This option offers students a chance to come to the pool and practice their swimming skills with their family. Two adults and up to three children can go for a casual swim at any time when the pool is available. There is no maximum number of family swims that can be used per term/intensives. Family swims are valid until the end of the following term’s holidays. Eg. An absence in Term 1 may be redeemed as a family swim until the end of the holidays after Term 2. To redeem your family swim, simply come in and tell the receptionist you want to use a ‘family swim’ for a missed swim lesson. They will mark your absence on the computer to show you’ve come in for a family swim. While one child is having their lesson, do you need childcare for your other child/ren? We can help. We have child minding facilities for clients’ children while they are in the centre. The playroom is open 9am-12noon weekdays. Children 6wks-preschool age can play and participate in craft activities while you are doing your activity within the centre. CLICK HERE for more information on the supervised playroom. Where there is a public holiday there is no lesson and you don’t pay for it. CLICK HERE for outline of how many classes there are each term in 2017. Before the end of term, current students and siblings can book into the class times they would prefer for the following term. One week before the end of term, we open the following term’s classes to new and returning students. You can phone us any time after this date to enrol, however, we also offer a call back service so that we can call you in case you forget to call us. To place your name on the call back list, CLICK HERE. CLICK HERE for Direct Debit Update to Credit Card or Bank Details Form.